Neato and iRobot are at the top of the robot vacuum cleaner manufacturers list; there’s no denying that. But who would win the 1v1 matchup? To find the answer to that question, we set the article in a Neato vs Roomba fashion, with iRobot Roomba 960 representing iRobot and Neato Botvac D7 representing Neato Robotics. Who wins? Neato vs Roomba: Which Vacuum Is Better? Neato vs Roomba: Which Should You Buy? It’s hard to compete with Roomba vacuums, especially with their most recent Roomba 900+ series. The Roomba 960 is overall a better cleaner and is more effective on carpets. It is also able to vacuum large debris more efficiently. Neato robot vacuum has better navigation and longer battery life, but it offers less consistency in the way it works. 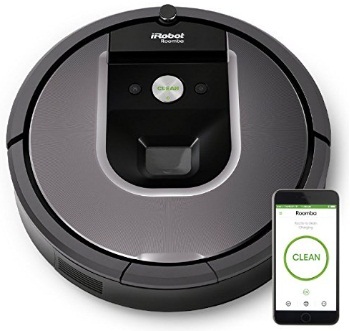 Moreover, Neato D7 is more expensive than the Roomba 960, but other navigation, it doesn’t provide anything the Roomba 960 can’t offer (for less cost). This vacuum features Neato’s standard D shaped design, which helps the vacuum cleaner around the corners and rough edges. The vacuum has an excellent navigation system, long-lasting battery, WiFi connection, Alexa control, and Virtual No-Go Lines. Smart Mapping is D7’s most significant feature, allowing the vacuum to learn and adapt to the room it cleans, helping it become more efficient with time. It also comes with Spiral Combo brush, which allows it to vacuum pet hair more effectively. Excellent battery (up to 120 minutes). Connects to Alexa// wifi control. Reato robot vacuum is expensive and sophisticated, featuring excellent navigation system, long battery life, and outstanding vacuuming performance on all surfaces. It is an excellent robotic vacuum for pet owners, and for households that have the majority of their floors covered with carpet. Roomba 960 features iAdapt 2.0 Navigation System, which is excellent, but not as good as D7’s SLAM system. Still, Roomba 960 has a lot of guns in its arsenal. Concretely, it connects to iRobot’s HOME app, with which you can program and schedule the robot. It features virtual walls (see video here) and works with Alexa and Google Assistant (voice activated control). Roomba 960 is an excellent pet hair vacuum and works well on all surfaces. Roomba 960 is less expensive than D7, but it has a weaker battery and inferior navigation system. Dirt Detection technology enhances vacuuming performance. Connects to iRobot HOME app. Works with Alexa and Google Assistant (voice-activated control). Excellent all surface cleaning performance. A solid item for pet owners. Has a relatively weak battery. Can get lost (especially if the room is too cluttered). Roomba 960 has everything a robotic vacuum needs: it is smart, it learns and adapts. And if it had better navigation and more extended battery, it would have been perfect. But Roomba 960 also costs a substantial amount of money, even if it is a bit cheaper than the D7. When comparing robotic vacuum cleaners, one should always pay attention to the way these vacuums were designed and built. 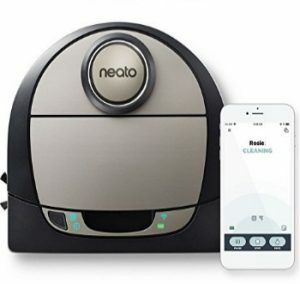 Here, we compare Neato’s and Roomba’s most essential characteristics, such as design, cleaning power, unique features, value, and so forth. Both these modules represent standard Neato and Roomba designs. D7 is 12.5 x 13.2 x 3.9 inches big and weighs exactly 8 pounds and features D shape design, which helps it clean corners and areas that are very close to the wall. Roomba 960 is 13.8 x 13.8 x 3.6 inches big and weighs 8.6 lbs. It is a bit bigger and heavier than the D7, but Roomba is 0.3 inches shorter, which may make a difference with cleaning beneath low-profile furniture. D7 offers the much more unique look, and we find it to be very futuristic looking. Roomba 960 features iRobot’s Aeroforce Three-Stage vacuuming system (Check above video), Tangle-Free brushes and the Power Lifting technology. When combined, these features give Roomba 960 a lot of cleaning potential, and excellent performance on all surfaces, particularly on the hardwood. On the other hand, D7 uses excellent suction power in combination with plenty of attachments, such as Spiral Combo Brush and a Side Brush. Both perform well in corners and tight spaces, with D7 delivering slightly better performance, thanks to its D shape design. Roomba 960 runs for only 70 minutes, but it does have Recharge And Resume technology, meaning that it will clean, recharge, and then pick up where it left off. Roomba 960 uses HEPA filter, D7 uses Neato’s Ultra Performance Filters, both being excellent for people with allergies. Most importantly, both of these vacuums automatically adapt to the surfaces they clean, fully utilizing the power of their side spinning brushes, Multi-Surface brushes, rollers, and other cleaning tools in their arsenal. D7 relies on cleaning power depends mostly on its all surface Spiral Combo brush. In combination with the side brush and a powerful motor, D7 struggles not with cleaning on hardwood, tiles or carpet. In fact, on carpets, it performs better than the Roomba 960. Roomba uses Dirt Detect technology (see here), in combination with Aeroforce Cleaning system, to clean your home most efficiently. Roomba 960 is also right on all surfaces, but it may struggle with too much pet hair (on carpets). 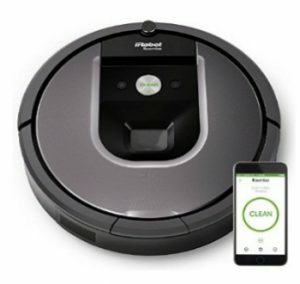 We should also point out that, because D7 has the more advanced navigation system and longer battery life, it will get the job done quicker than the Roomba. Also, it has a slightly larger dustbin capacity (D7 is 0.7 l, Roomba 0.6), which means that the Roomba will require more frequent dustbin emptying. In short, we would say that the D7 wins the cleaning battle since it is more efficient at carpets, has a longer battery life, more sophisticated vacuuming system, and a larger dustbin. Neato D7 is more efficient and more effective vacuum cleaner, thanks to the more advanced navigation, long battery life, and larger dustbin. Despite losing the performance duel, Roomba is still a more valuable option. It is less expensive, offers almost the same performance, and is more robust and more consistent than Neato. Compatibility with Alexa, and Google Assistant, connection to a smartphone app, Virtual Walls, scheduling: both of these vacuums have these characteristics. Neato is slightly more efficient than Roomba when it comes to pet hair collection. Roomba is more beginner/user-friendly. The app is fairly easy to use, and the Vacuum itself acts very autonomously. Taking care of Roomba (maintenance, part replacing, etc.) costs less time and money. We suggest Roomba 960, for a couple of reasons. Firstly, it is less expensive. Secondly, despite being less efficient on the carpet and with pet hair vacuuming, Roomba 960 is far more consistent than the Neato. Thirdly, Roomba’s parts are inexpensive, making it easier for Roomba users to purchase replacement parts. Also, Roomba’s customer service is much more friendly and efficient than Neato’s. D7 is more expensive, more advanced, and even more efficient vacuum cleaner, having better battery, larger dustbin, and slightly better navigation system. If the Neato D7 vacuum cleaner were more consistent than it is now, we would suggest you go with it. Before we wrap this up, we should say that this article didn’t cover all of the Roomba’s and Neato’s features. Instead, we focused mostly on the vacuuming power and performance, since these are vacuums we are reviewing. And to those that didn’t know, these aren’t the only vacuums made by these companies; there are plenty of other models out there, some better, some worse, some cheaper, some more expensive. Still, if you seek durable, robust and sophisticated robotic vacuum, Roomba 960 is an excellent choice. It is ideal for small house owners, pet owners, allergy sufferers, and for people who want their house cleaned for an affordable price with minimum expenses.